As the year winds down, I thought I would give you a preview of what’s to come on this blog. I’ve mentioned in the past how much I enjoy being able to download free books from Project Gutenberg. Given a choice, though, I do prefer physical books. This month I received some holiday cash from relatives and I went a bit mad at the used books stores and library friends’ sales. It’s easy to justify buying classics when you have a blog about the Great Books. In the picture: A complete set of the Durants’ The Story of Civilization, both volumes of Somervell’s abridgement of Toynbee’s A Study of History, plus Toynbee’s essay collection Civilization on Trial, The Federalist Papers, Herodotus’ The Persian War, Milton’s Paradise Lost and Other Poems, Virgil’s Aeneid, Tolstoy’s Anna Karenina, Thoreau’s Walden and Civil Disobedience, Hawthorne’s The Scarlet Letter, Allan Bloom‘s translation of Plato’s Republic, de Sade’s Justine, Philosophy in the Bedroom and Other Writings, three tragedies of Sophocles, Joyce’s Dubliners, Freud’s Civilization and its Discontents, Fitzgerald’s The Great Gatsby, and Hesse’s Siddhartha. 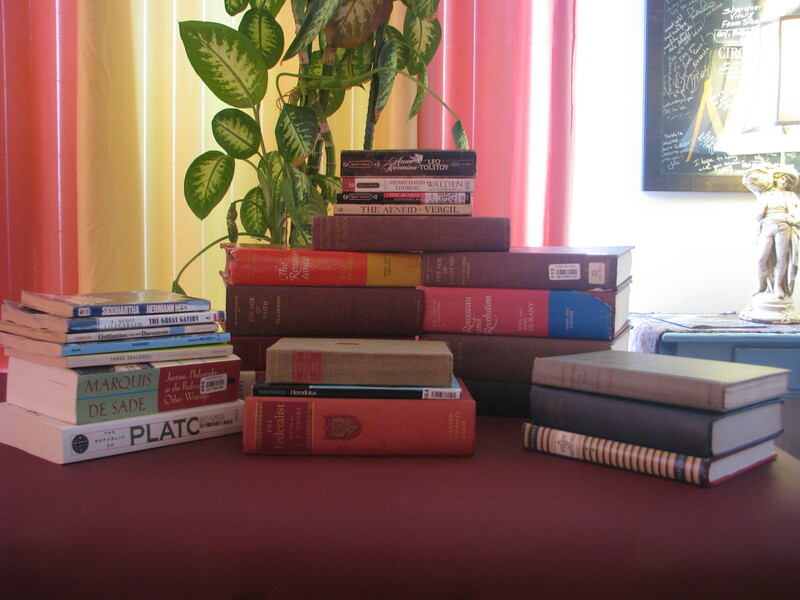 Not shown is a collection of Aeschylus’ plays that I have momentarily misplaced. And of course I still have 36 more books of the Hebrew Bible to cover. I plan to read and blog about all of these over the next two years. I must offer the caveat, however, that as I get closer to my own book deadline my blogging projects may be pushed to the back burner. In regards to my next book, I am still in a very early phase of the writing and I don’t want to give many details. I will say, however, that it deals mainly with modern American history. I can also confidently promise you it will be a much more enjoyable read than my last book–though I suppose that is faint praise, considering that my last book started life as an operations management thesis. Speaking of the operations/data science end of things, I’m sure I’ll be writing a few more of those posts too. I also have some ideas for a couple of posts about the business side of writing which some of you should find interesting, since most of you are writers like me. I’d like to wish a hearty “thank you” to everyone who has read and subscribed to my blog in 2014. See you next year! I had originally planned to write one post about each of the traditional groups of books in the Hebrew Bible: The Law, The Prophets, and the Writings. As I read, however, I realized that this is not the most natural grouping. Therefore, this first post will concentrate on the first four books, of the five which make up the Law and also known as the Torah to Jews and the Pentateuch to Christians. Most of the current arrangement of the Hebrew Bible is a result of the scroll-based book technology on which it was stored. Long scrolls are unwieldy, so the Hebrew Bible was divided into “books” which would fit on a standard 30-foot scroll. Also, it was common practice to store the scrolls in clay jars and it was convenient to have one jar for “Law” books, one for “Books by Prophets”, and so forth. This traditional organizational scheme was retained even after the Bible began to be written on codex-type books with pages. Even though they take up three scrolls, however, it is fairly clear that the books of Genesis, Exodus and Numbers are essentially a single, continuous work. Leviticus is a closely related, but separate work; even though the author places it within the same time-line as the other books by adding the introductory words “And the lord spoke to Moses saying:” at the start of each section, it is really not a narrative work at all so much as a ritual handbook for the priesthood. Deuteronomy, while it is presented as Moses’ last speech to his followers, is actually the prelude for a completely new series of books, a national history which follows the Hebrew people from the initial invasion of Canaan, though the golden age of King Solomon, to the final conquest of the promised land by Babylon. Deuteronomy sets out the major theme for the rest of the story, which is basically “As long as the people remain holy and follow the law they will be rewarded with peace and prosperity, but as soon as they transgress punishment will result.” I will be writing about this Deuteronomistic history in my next post. For now, however, I will return to the other four books of the Law. The Genesis-Exodus-Numbers cycle and the book of Leviticus were compiled at a time after the promised land had been conquered by the empire of Babylon. The Babylonian government prevented a possible insurgency by deporting the priests and aristocrats of Judah to other parts of the empire. In a semi-literate society, the elite are the main preservers and transmitters of culture. After they were removed, the native Hebrew culture was in danger of dying out. Meanwhile the upper-class Hebrews, living abroad, were at risk of being assimilated and adopting foreign ways. With the old verbal traditions imperiled, it became imperative to create a single, definitive version of the Jewish origin story and to write down as many of their key customs and rituals as possible. The project was a remarkable success. There is no question that the existence of the Torah is one of the key factors which have allowed the Jewish people to retain their unique cultural identity throughout history. According to Edgar Schein, MIT Sloan’s famous Organizational Behavior scholar, culture is made up of artifacts, values, and assumptions. All three of these are recorded in the Torah. Artifacts are behaviors and physical objects which are observable to outsiders. Examples of behaviors would be the cleanliness laws (Lev 11-18) and the rituals of the Levite priesthood. Examples of physical objects are the furniture of the Holy of Holies (Ex 25-27) or a special hair style (Lev 19:27). Deeper and more important than artifacts are values, such as the sanctity of marriage (“Thou shalt not covet your neighbor’s wife.”, Ex 20:17) or proportionate punishment for crimes (“An eye for and eye and a tooth for a tooth” Ex 21:22). Deepest and most important are assumptions, such as the idea that God created mankind in his own image (Gen 1:26). By identifying and codifying all of these, the Torah provides a static snap-shot of Hebrew culture in the 6th century BCE, a fundamental baseline reference for all future Judaic culture. In fact, some noted historians, particularly Arnold Toynbee, have suggested that Judaic culture never changed appreciably after this time. In A Study of History, Toynbee refers to the Jews as a “fossil society”. Toynbee probably should have chosen a more politic terminology; generations of writers have taken offense at the term and accused him of antisemitism. All he really meant was that the Jews, who 2600 years ago were one culture among numerous, relatively similar, Semitic cultures, have managed maintain their cultural integrity millennia after their neighboring cultures have become extinct or been assimilated into other civilizations. So, having looked at why the books were written, let me turn to the story that they contain. I am, after all, a writer, so stories are my primary interest. Genesis begins with two creation stories, then the story of the flood. In broad terms, these are similar to other surviving mythology which we have from the near and mid-east. Compare, for instance, the flood narrative in the Babylonian Epic of Gilgamesh, or the mythical battle between Marduk and Tiamat, which has echoes in the incident with the serpent (i.e. Tiamat) in Eden (Gen 3). Then, towards the end of Genesis 11, the book introduces Abram, who is herding sheep in Mesopotamia, where these myths come from. Abram, later known as Abraham,is the ancestor of all the Israelites. From this point on, the story follows his descendants from one generation to another. The story itself is quite interesting from a historic point of view, even though we must make allowances for bias and the fact that the goal of whoever edited together to book was more to foster a sense of Jewish identity than to lay out an accurate historical account. In the life of Abraham’s grandson Jacob his descendent, now an extended family of 70, emigrate to Egypt to become what we would now call guest workers. They are able to get permission to settle there because Jacob’s son Joseph has obtained a plum position in the Egyptian bureaucracy. They stay there for several generations, breeding prodigiously after the fashion of the poor everywhere. As time goes on, the narrative begins to describe them as slaves. Even today, in much of the world, the distinction between guest workers and slaves is often a blurry one. Eventually relations between the Israelites and the Egyptian government deteriorate and they leave, either because labor conditions in Egypt had become intolerable, or because the Egyptians force them out. Probably, the political situation was complicated and messy and both sides were glad to see the last of each other. The Bible is only the Hebrew side of the story. The Egyptians of the time, while they kept extensive written records, were less interested in writing about what we would call “current events”. The first Egyptian work that mentions the episode at all was written at a much later period by the priest Manetho. All we have is a paraphrase of it as cited by the Roman historian Josephus from the first century C.E.. According to this account, the Hebrews were living in poverty and squalor when an epidemic had broken out among them. The Egyptians evicted them from the country because the plague was beginning to spread to the natives. Moses was an Egyptian priest who went among them to teach them rules of Hygiene and cleanliness modeled on those of the Egyptian priesthood. The biblical account, on the other hand, is that the Hebrews were oppressed by the Egyptians, who resented the incredible fertility granted under the terms of their covenant with God. Moses, an Israelite spokesman, created the plagues to force the Pharaoh to let them go. Perhaps in reality some elements of both stories are probably true. Whatever actually happened in Egypt, the Hebrews migrate into the Syrian desert. During this period, Moses receives the Law from God and the narrative begins to be interspersed with passages of law. After living in the desert for 40 years, the Israelites have bred and trained enough fighting men to surge forth from the wilderness and overwhelm several small cities on the East bank of the Jordan River. The story in the Torah ends with the Israelite horde preparing to cross the river and invade the country of Canaan, under their leader Joshua. In my next post, I will talk about what happened after they crossed the Jordan and conquered their promised land. I would like to conclude my study of Homer with some reflections on one more subject which I find fascinating. Both the Iliad and the Odyssey were originally oral works, composed completely in Homer’s mind and and transmitted, possibly for generations, without benefit of writing. Let’s pause for a moment and consider how monumental this accomplishment was. When we print each poem today it runs to about 500 pages of text. How many of us could commit something that size to memory? Yet even hundreds of years after the poems had been written down we read of aristocratic Greek boys memorizing them the full text of one or both poems. A fully trained bard like Homer might well have known a repertoire of dozens of epics. During the classical period poets often recited the Iliad and Odyssey, competing to give the most word-perfect rendition. Gladstone, in Studies on Homer and the Homeric Age, points out that this tradition is probably why the versions of Homer that came down to us are so free of variation, since additions and improvisations would have been penalized. How did all of these people memorize such long poems? Bards weren’t unique to the Greek dark ages, either. It seems that the majority of cultures developed a similar role at some point. Our own Indo-European language group has a diverse tradition of (originally) oral epic poetry including The Bhagavad Gita, the medieval French chansons, the Celtic epics, and the sagas of Scandinavia. In many cultures the bard is also a priest or shaman. In ancient Ireland, for example, bards were members of the priesthood who ranked only slightly below druids. In Homer’s Greece it was considered sacrilegious, or at least very unlucky to kill a bard. For this reason, the bard is one of the only men whom Odysseus spares when he massacres the suitors. Perhaps the bard’s incredible memorization abilities were one of the reasons they were considered to be so special. Or urged by wrongs, to Troy’s destruction came. A throat of brass, and adamantine lungs. Their names, their numbers, and their chiefs I sing. 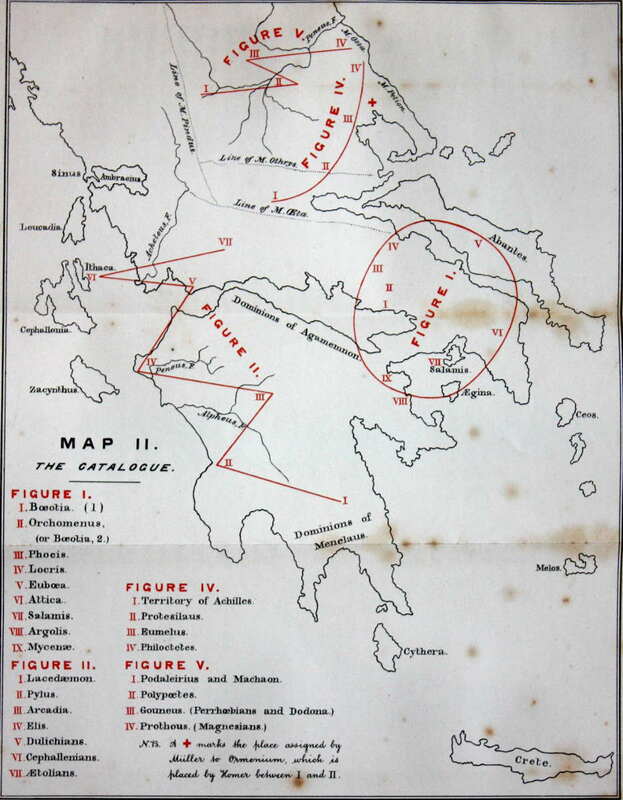 Gladstone’s book, from which I borrowed the following maps, explains how Homer organized the information in the catalog to make it possible to memorize it. Basically, Homer uses a technique similar to a mind palace, an ancient technique in which information is visualized in concrete form inside an imaginary “mansion” or “palace”. Fans of the television show Sherlock will be familiar with this from the interesting visual sequences showing Sherlock’s thought process. Homer’s mind palace, however, is the entire Greek world. He traces a nearly circular arc that encompasses the Greek mainland, Crete, and the islands. Along each subsection of this arc, he follows a zig-zag path which allows him to mentally recreate a journey through that part of the countryside, visualizing each city and its chieftain. Locations Mentioned in the Catalog of Ships. from Gladstone (1855) [Public Domain]. Scanned by Project Gutenberg. 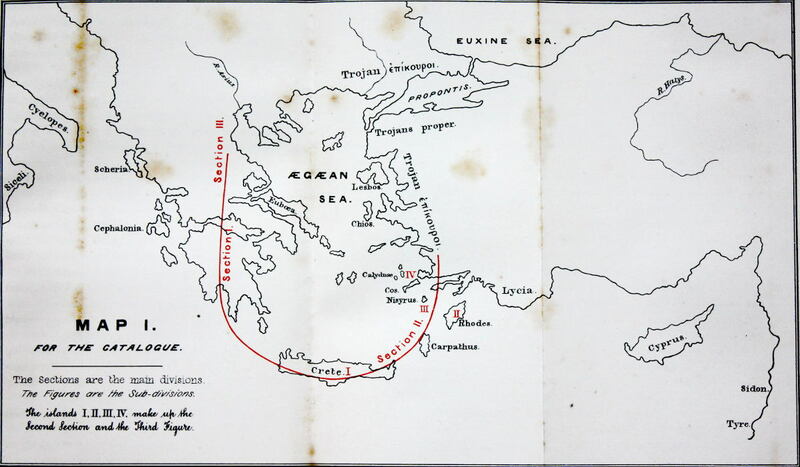 Locations Mentioned in the Catalog of Ships – Greek Mainland. from Gladstone (1855) [Public Domain]. Scanned by Project Gutenberg. Homer most likely never saw a map in his life, so he was probably mentally stepping through his own memories from his wanderings, or imagining the oral descriptions of other travelers. The technique is surprisingly effective–much more so than the alternative. Have you ever tried to list all the state capitals without looking them up? I bet you missed one, and couldn’t figure out which it was. Perhaps next time you should try mentally driving from each capital to the next. That’s what Homer would have done. My partner, who was a professional actor and performance artist for many years, gives another perspective on memorization. She says that she was trained to remember her lines kinaesthetically. She feels different lines in different parts of her body and uses particular movements to unlock memorized text. We don’t know how much the Greek bard moved around while they were reciting, but they may well have used some of the same tricks to trigger their memories. Most likely, they used a combination of several different memory techniques, and learning these techniques was as important a part of their apprenticeship as learning the lines of the poems themselves. With that, I leave Homer. I will be back to Greece and her poets before long, but, for now, I have begun reading another body of work which was initially transmitted orally: The Hebrew Bible. I’ve just read the Odyssey, which means that I have finished reading the first author on my Great Books reading list. In some ways the Odyssey is much more accessible to us modern readers than the Iliad. The basic format, in which the hero journeys from one fantastic encounter to another before finally returning home, is quite familiar to us from works like Huckleberry Finn, The Hobbit, and thousands of others. Fans of Joseph Campbell will recognize it as a classic “hero’s journey”. The Iliad, on the other hand, is a type of epic that focuses on battles and the deeds and lineages of heroes. This form would have been just as popular in the ancient world, but seems a bit strange to us moderns. Also, in the Iliad, in the words of W.E. Gladstone (1855), “a more antique tone on colouring prevails, as it is demanded by the loftier strain of the action.” Even so, I found that the Iliad was my favorite of the two. This might be due to the translations I used, however: Alexander Pope worked alone to translate the Iliad, but he subcontracted several chapters of the Odyssey, which may have made it harder to make the text flow smoothly. The Odyssey is still a wonderful story, and very well worth reading. Few authors have ever had Homer’s gift of sketching such vivid characters and locations in only a few lines of poetry. Even after nearly three millennia, these people and places live for the reader. As a writer, I have an almost irresistible urge to borrow from Homer and put my own stories in his universe, and I am hardly alone. Virgil, Chaucer, Shakespeare, and a legion of others through the ages read Homer and were inspired to write what our era would call “fan fiction”. Homer is the mother of all expanded universes. Even today a quick scan through Amazon shows hundreds of modern novels, plays, and movies that adapt Homer’s stories. It’s easy to see why. I feel I could take nearly any character from the Odyssey, even bit players who are only mentioned on a few pages, and create a short story, if not a novel, about them. This is gratifying, since my main motivation to read the Great Books is to improve my writing. I can only hope that the other 146 authors give me so many ideas. Structurally, I found a few surprises about the poem. Most adaptations of the Odyssey focus on the journey itself. Of the twenty-four books in the original, however, the first four follow Odysseus’ son Telemachus and his frustrations with the boorish suitors who have come to woo his mother. Unable to force them to leave, he sets off to the mainland to find news of his father. As characters, Telemachus and his mother, Penelope, are at least as developed as Odysseus himself. The last twelve books occur after Odysseus arrives home in Ithaca, so that only the eight books in the middle deal with his epic journey. Furthermore, I noticed that some of the most fantastic elements of the story, such as the encounter with the cyclops and the incident when Circe turns Odysseus’ men into swine, are actually told by Odysseus himself in the form of flashback dialogue. One wonders if the cunning king was embroidering his stories a bit in order to impress his hosts. Overall, the story structure is much more sophisticated than I would have expected from such an ancient work. It is fabulous to me that his poem, composed (probably) in the 7th century BCE and translated in 18th century English, reads so much like a modern novel, but I suppose that is what makes a Great Book. See also: You may be interested in an essay I wrote several years ago about the movie O Brother Where Art Thou? and its relationship to the Odyssey and Campbellian meta-mythology, or another essay I wrote about Constantine Cavafy’s poem Ithaka. I ask that you bear with me as I continue my detour of discussing books about Great Books. Reading the great books to improve myself as a writer is likely to be a pretty long project–probably even more time consuming than the time I decided to watch all 726 Star Trek episodes in chronological order. Before I get started too far into it, I want to be sure and examine some of the motivations for someone to launch on a Great Books reading program. Next time I will return to discuss the Odyssey. 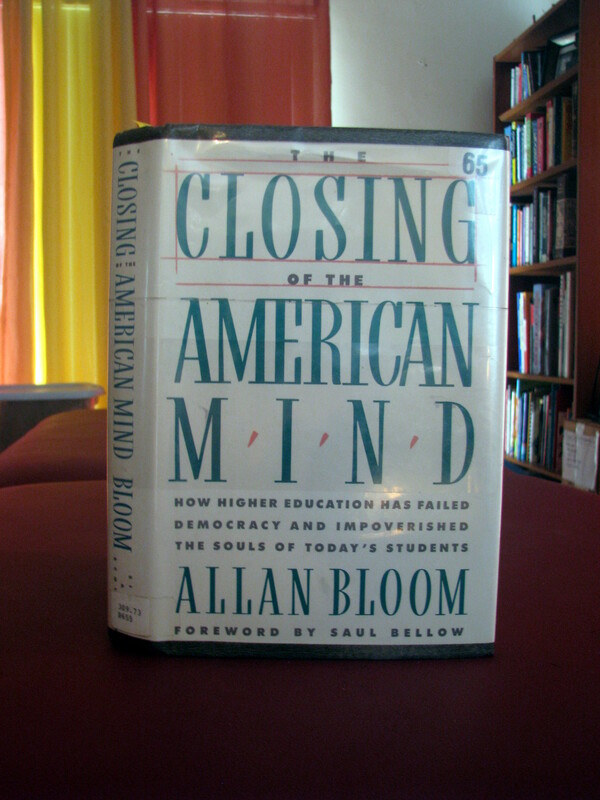 I just finished reading The Closing of the American Mind: How higher Education has Failed Democracy and Impoverished the Souls of Today’s Students (1987) by Allan Bloom. Allan Bloom was a Great Books veteran, having produced well respected translations of Plato’s Republic and Rousseau’s Emile, as well as two books on Shakespeare. The Closing of the American Mind, written a few years before his death, is his magnum opus of popular nonfiction and is one of the last articulate 20th century pleas for greater integration of the Great Books in education. The book covers quite a bit of ground, since Bloom was trying to trace a complete intellectual history of the purpose of a liberal education in our society. He brings up quite a few interesting points, any one of which would make a good blog article, but I will try to keep this post brief. Bloom argues that in a liberal democracy, which by definition has no aristocracy or powerful established religion, the university is the only place where young people have a chance to experience a larger world of ideas and possibilities before going back to the “vulgar bourgeoisie” world of their future careers. Furthermore, a university is the only place where dissenting or new ideas are allowed to thrive, free from a democracy’s moral consensus. However, the fact that modern universities exist within a democracy means that they have been under pressure to encourage “openness” to different ideologies, lifestyles, values, etc. This has caused the academy to fragment into a “Chinese restaurant menu” of different disciplines, depriving students of any commonality of experience or deep exposure to the core ideas that make up our civilization. Also, the wide acceptance of Neitzeism and other German philosophies has led to a new nihilism in both the academic Right and the academic Left, causing them to abandon teaching about The Good and instead teach a vague sort of value theory where nothing is good or bad and a dangerous relativism where all lifestyles and philosophies are equally valid as long as their proponents exhibit a proper level of commitment, leaving students adrift with no means to evaluate anything in terms beyond simple utility. Bloom’s solution is a return to the wellsprings of Western Civilization, i.e. “the good old Great Books approach.” However, he admits that this is unlikely to happen now that the humanities have been stripped of their traditional prestige and allure, the physical sciences have decided they don’t need the other disciplines, and an increasing number of undergraduates are shameless careerists, intent only on getting the prerequisites they need to get into professional programs. He points out, however, that even if there is no solution to the problem, the problem itself is eminently suitable as a subject for study by philosophers. I honestly am not sure whether I agree with Bloom. Many readers have detected overtones of elitism in his argument. If we were to reset the curriculum to what it was in, say, the Victorian period, it would again create a massive advantage for upper-class, white males. On the other hand, I would embrace any program that could teach undergraduates to read and think, two things which very few of them now do well. Also, as a member of Western Civilization, I do think that it is important to protect and cherish our own intellectual and cultural heritage. On my most recent trip through college I was frequently shocked to learn what little awareness my fellow graduate student had of Western culture, literature and history. There education had failed in that respect, and there must be a better system. However, by the 17th century, philosophers had come up with an even better scheme: Enlightenment. This plan was Machiavellian in the truest since of the word, given that Machiavelli was the one who thought of it. By simultaneously showing the world the fruits of scientific inquiry while teaching a theory of rights, the philosophers inspired revolutions which led to liberal democracy and allowed the existence of the modern university–an institute dedicated to teaching and protecting philosophy. Once the rule of Reason was firmly established, the philosophers no longer needed aristocratic patronage and switched to”the party of democracy”. Now, if we return to Bloom’s main argument, the universities are in a state of decline and philosophy is no longer central to education, yet philosophers are now unable to survive outside the university. Bloom would like to change the university back to what it once was, if possible. For my own part, I must ask if it isn’t time for philosophers to come up with a new plan. If the aristocracy is gone, and universities are now more of a hindrance than a help, perhaps it is time to move on. To where? I don’t know; I’m no Machiavelli. It seems, though, that this too is a good question for philosophic inquiry.